Yep, This is the Freak-Out Zone! Welcome to the crazy train! Sometime yesterday I officially hit the freak zone. In my reckless attempts to clean house, make schedules for the kids, wash clothes, write thank you notes, make lists of things I need for Duke…and breathe…I hit the freak zone. Reality struck. I just tried to breathe. This morning I woke up thinking wash sheets, wash towels, mop floors, clean baseball uniforms, remember to check on this and that so it can be added to the schedule. My brain was mush. I double checked to be sure I had taken my brain meds…check..so I should be able to think more clearly than I was. I was running in circles and getting nothing much accomplished. I felt like the list was just growing….out of eggs, out of bread, out of turkey, need stamps, need TO BE ABLE TO DRIVE! I need to have some control! And that is where I stopped. So here is the truth, I talk out loud to myself. I stopped spinning and said “in my weakness, He is strong”. Then I pictured the Incredible Hulk in all his green glory busting out of his clothes and roaring to my rescue. Yes…I did just make an analogy of the Incredible Hulk to God, but forgive me, I am a visual learner. I needed to SEE God rescuing me. I realized I needed to sit down and stop and find His presence. I opened my devotional and…YES…I did laugh out loud! No joking! 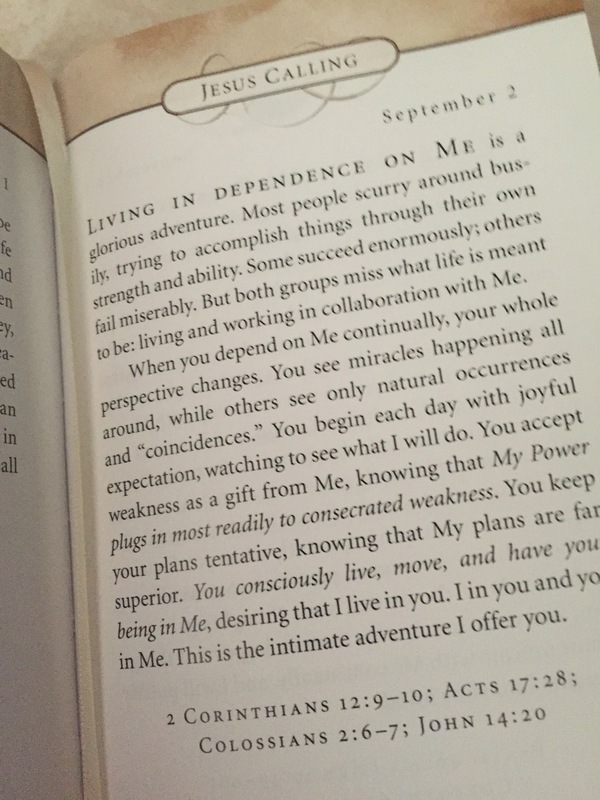 First words…“Living in dependence on Me is a glorious adventure” and then it continued “You accept weakness as a gift from Me, knowing that My Power plugs in most readily to consecrated weakness. You keep your plans tentative, knowing that My plans are far superior.” I actually looked back at the date on the page and then went straight to the calendar to be sure this really was the devotion for this day because this puzzle just fit together too neatly. Yep, September 2nd. I sat back down and reread several times, scrutinizing each sentence, each phrase and the scriptures. This was just all too freaky! At the same time this is my God. He meets me where I am and brings to me all that I need each day to get through. Control has always been hard for me. Losing it has felt like a death of part of myself. I have lost the ability to make so many choices for myself. Sometimes it is little things like wanting to listen to my own music in the car, wanting to select the air temperature in the car or just wanting to open the car door from the driver’s side instead of the passenger side. Here is the deal, control was never mine to begin with. Control of my life is in God’s hands. Yes, I am weak. That is ok, and apparently I am supposed to be weak! God is stronger, He is stronger than the Incredible Hulk and He will continue coming to my rescue. He will calm me and bring me to dependence on Him instead of trying to depend on myself. I reminded myself that this freak show crazy train that I’m riding right now as I prepare for Duke is because I have the opportunity to get better. I have to focus on the end, not the process. We have prayed for me to be better and this is the beginning of that process. I don’t know how long this part of the process will take, I don’t know how hard it will be both physically or emotionally, and I don’t know if it will give us the answers we need. What I have to focus on is that God is calling me to depend on Him, for all the little things and for all the big things. Yesterday I had lunch with some good friends from my gym. 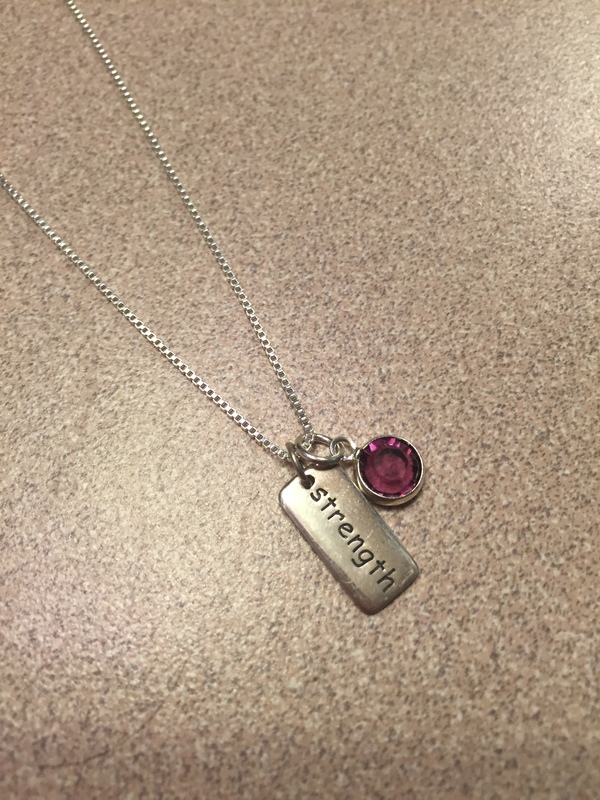 They gave me a beautiful necklace with a purple stone, which they remembered is the color for Epilepsy Awareness and a charm with the word “strength” inscribed. They said when I feel weak, touch your hand to your neck and remember you are strong and remember the many people who are praying for me when I am weak. They told me I was strong and I am not alone and to focus on the strength that is given to me. Nope, I indeed am not alone. I am surrounded by more people than I can count and they are pouring out their love and their prayers on behalf of your family. This fulfills my need for a visual picture of where I am right now. Most importantly I have to rest in God’s hands and know that I must start each day anxiously waiting to see what God will do and where He will move today. This entry was posted in Epilepsy, Faith, Family, Perseverance, prayer and tagged Duke, Epilepsy diagnosis, Faith.